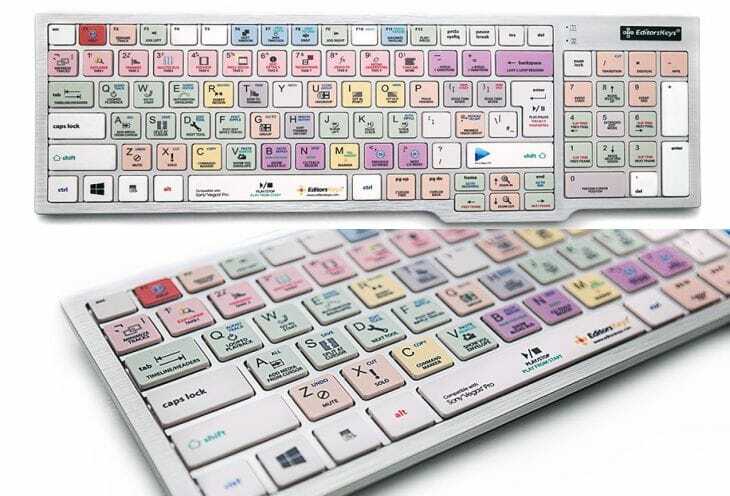 Yesterday Editors Keys released their brand spanking new keyboard for Sony Vegas Pro, which contains over 116 shortcuts for the program making that whole editing process quicker and easier than ever. With a modern design the ultra slim PC keyboard features detailed program icons for convenient editing and valuable shortcuts. This will be the first outing for Editors Keys and Vegas which was helped with the blessing of Sony to create a program dedicated keyboard and we are sure this will appeal to a large group of editors, especially at universities and schools. Expected to retail in the US for $94.99, UK customers will be looking at a region of around £59.99. With coloured keys this new keyboard is an attractive accessory for editing and and used respective colour coding for the use of similar tools, not to mention the easy to understand standout icons. According to the company director of Editors Keys.com, Mark Brown, “this is going to change the way you edit in Sony Vegas forever“. For more details on the pricing and availability the Editors Keys webpage highlights a sale price reduced from £99.99 down to £59.99, along with all the added features including a lifetime warranty. The Sony Vegas Pro PC Keyboard is slim in design with a professional studio look providing users with the worlds most used shortcut keyboards that makes editing sessions more enjoyable, so will you be looking to get the new Sony Vegas Keyboard for the PC?